Nine years ago, Staples Players produced “Twelve Angry Men.” The classic courtroom drama was staged in the Black Box Theater — in the round. The audience surrounded the set, on all 4 sides. I saw it 3 times — always in a different spot. Each vantage point was unique. I saw 3 versions of the same play. 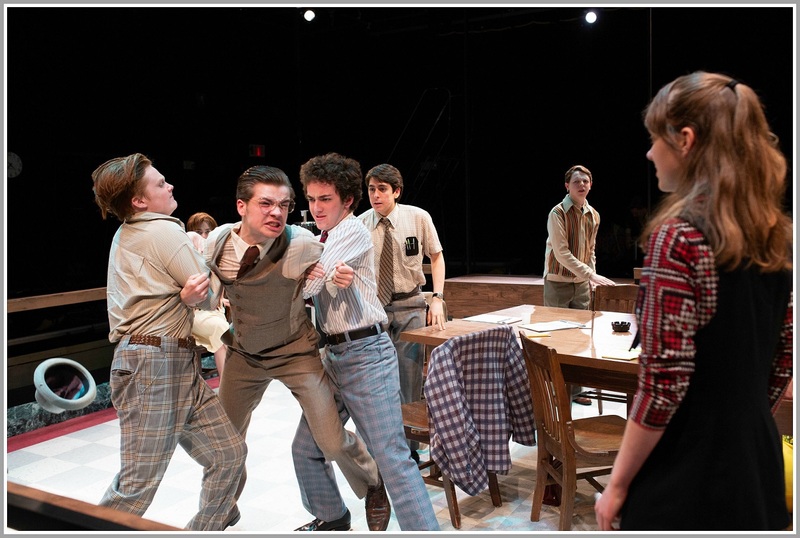 This week, Players again produce “Twelve Angry Men.” Once again it’s in the round. “With racial profiling and challenges to justice ever present in the news today, this felt like the right time to bring back the show,” Roth says. “Twelve Angry men” explores the dynamics between 12 jurors, from different backgrounds, as they meet on a hot summer day to decide one man’s fate. Though the play was first performed live on CBS in 1954, the preconceptions and assumptions of the characters are quite relevant today. For several seniors, “Twelve Angry Men” — which Roth and Long have cast to include female jurors — will be the final Players show before college. Sophia Sherman — who will study acting at the University of Michigan — plays a Russian immigrant. Her passion for democracy, and strong statements about immigration, race and class difference, are “eye-opening,” Sherman says. My eyes were opened — in 3 different ways — 9 years ago. I look forward to seeing the same show, in yet another way, soon. 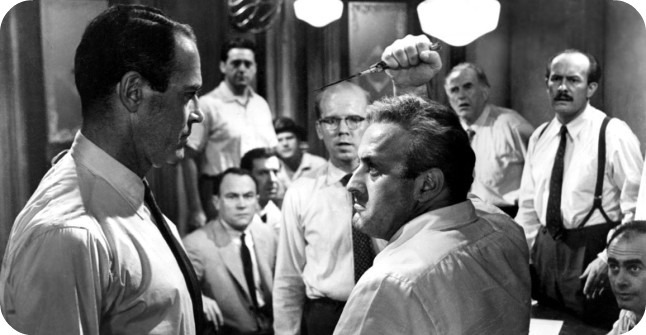 Everyone knows “Twelve Angry Men.” The classic drama about jury deliberations at a murder trial has been performed all over the world, since its 1954 “Studio One” CBS debut. A few years ago Staples Players produced a compelling version, in their Black Box Theater. “Twelve Angry Men,” on CBS. 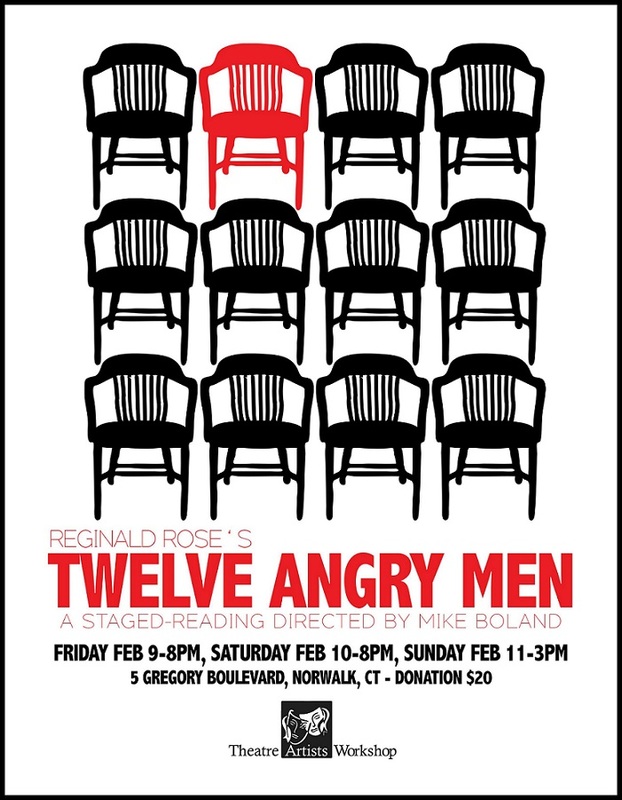 “Twelve Angry Men” will be featured at 3 staged readings next month, at Theatre Artists Workshop. The venue is on Gregory Boulevard in Norwalk — but it was founded in Westport in 1983 by Keir Dullea and his wife. Its first home was Pymander Books, on the Westport/Norwalk border. Early participants brought folding chairs, and $5. The Workshop soon moved to the then-closed Greens Farms Elementary School. In 1997 the town reclaimed the school. But — now in Norwalk — it continues, in a venue with lights, curtains, and risers with 99 chairs. Many Westport professional theater artists are members. But that’s not why this story is “06880” blog-worthy. It turns out that writer Reginald Rose — who won an Emmy for his teleplay, and an Oscar nomination for his 1957 screen adaptation — was a Westport resident. Rose lived here in the 1950s and ’60s — so he probably wrote “Twelve Angry Men” in Westport. (The drama was based on his own personal experience on a manslaughter jury.) He died in 2002, age 81, in Norwalk. Between 1950 and 1980, Rose wrote for all 3 networks. He also created, wrote and won 2 Emmys for “The Defenders,” the 1961 weekly courtroon drama. And — in another local twist — his teleplay “The Incredible World of Horace Ford” was the basis for a 1963 “Twilight Zone” episode. That show was hosted by former Westporter Rod Serling. Theatre Artists Workshop’s staged reading features Mike Boland, who performed “Twelve Angry Men” on its national tour, and 2-time Emmy winner John Wesley Shipp. Members have included Anne Baxter, Theodore Bikel, Christopher Durang, Ring Lardner Jr. and Jane Powell — and Westporters Sandy Dennis, Kevin Gray, David Rogers and Brett Somers. Most meetings are critiques of scenes, monologues and new writing. But several times a year, Theatre Artists Workshop opens their doors to the larger community. “Twelve Angry Men” is one such weekend. The fact that it has such a strong Westport pedigree adds just a bit more drama to it. “I want to serve on a jury,” one said. “I want to be a lawyer,” his friend replied. That’s one story of the power of the legendary high school drama troupe’s production of the intense courtroom drama. 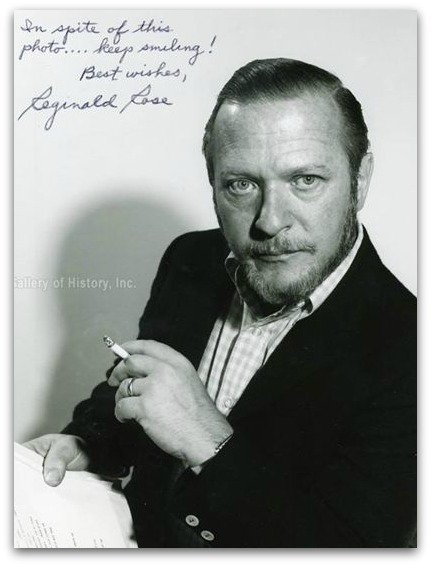 Here’s another: Earlier this week, the widow of Reginald Rose — the man who wrote the drama for television, then co-produced the movie version — bought a ticket for the Staples show. She could have seen dozens of productions of “Twelve Angry Men” over the years; she chose this one. One more story: designer Reid Thompson, a Staples grad, served jury duty several weeks ago. That experience shows, in the set’s superb yet stark details. Now 50 years old, it’s hard to imagine Staples Players coming up with anything new. But they always do. This time it’s directors David Roth and Kerry Long’s innovative staging. The jury sits in the middle of the Black Box Theatre, surrounded on all sides by the audience . Blocking is challenging — but the result is both intimate and compelling. “Twelve Angry Men”‘s final performances are tonight, tomorrow and Saturday (all 7:30 p.m.). Click here for more details and ticket information.